El. D. Mouzakis was founded in 1968 and has grown to export around the world. It is thought to be the best metallic thread on the market for hand embroidery and is called 'Au Papillon' (The Butterfly) Thread. 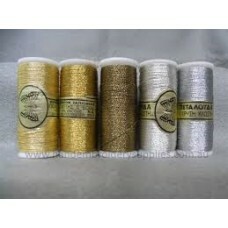 Au Papillon Fil d’Or Deluxe (known as The Butterfly Thread) is a very high quality metallic thread, ..